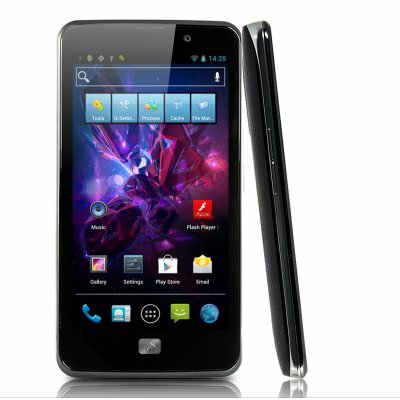 Successfully Added 720P Android 4.0 Phone "Clearview" - 4.5 Inch, 3G, 1GHz CPU and Dual SIM to your Shopping Cart. “Clearview” the crystal clear 720P android 4.0 phone with an extra large 4.5 inch screen and with high end specs including 3G internet connection and 1GHz CPU. If you are looking for the highest end resolution for your Android smartphone, it doesn’t come any better than the “Clearview” with 720P 320DPI resolution. 720P, meaning 720x1280, meaning WOW when you see what Android 4.0 (let alone games and media) looks like in HD. Naturally the “clearview” android 4.0 phone doesn’t stop there. The HD resolution displays on a very large 4.5 inch full 5 point capacitive screen giving your eyes tons of real estate to view on. 3G connection on WCDMA 850 and 2100 along with wifi N will get your downloads and streaming done post haste. The built in GPS will give you directions on the go when and where you need it. The “Clearview” even includes a 1GHz CPU for running all the apps and functions Android 4.0 phones can handle with aplomb. If you need super high resolution, mixed with size, speed, and looks, the “Clearview” is where it is at. A perfect gift for the discerning smartphone user, this is a guaranteed sell if you also happen to be a reseller. Buy today, get it shipped tomorrow, available direct by the best source of high end smartphones and Tablets, Chinavasion. on 2012-11-30 20:37:39 un-be-lie-va-ble !!!!!! ordered on 22/11/2012, delivered 7 days later to Belgium ! After using a HTC Touch HD for 3,5 years (which is like a century in technology ;-) I needed a new phone. I don't like Apple nor its policy and did not want to spend 700 EUROs to a Samsung Galaxy neither. Then my eye fell onto this phone : it is unbelievable for this price and does everything a Galaxy does : fast, beautiful build quality, perfect high resolution screen that reacts immediately on the slightest touch, 3G, Wifi, GPS, Android 4.... Why should you buy a Galaxy ? Just for the "Samsung" label printed on it ? No go for this guy ! Thanks Chinavasion, will be looking for a new tablet soon !!! A very happy customer. whats app is not working on this phone!!!!!!!!!!!!. rest looks good. After my HTC HD7 broke into two parts, I ordered this, and wish I never would have spent so much money on a stupid HTC. I just got the phone and I've been testing, is super fast, the screen quality is excellent, very good product.